On the back of Unique System (SEA) Pte Ltd of Singapore becoming the sole exclusive outlet within South East Asia for the Seaflex brand of market-leading Air Lift Bags, Pipeline & Cable Buoyancy and Load-Test Waterbags, some new exciting developments have taken place. A large inventory of SEAFLEX bags are now in stock and available for rental and sales. Ben Board, Sales & Site Support Manager from Seaflex UK has recently trained all the workshop technicians. Business Development Manager, Vikram Subramanyan has been tasked with oversight for Seaflex Buoyancy and Ballast sales and support for the Far East. Andy Ching has joined as Regional Head of Sales for Survey, Non-Destructive Testing and Buoyancy & Ballast. Andy also takes over the SEAEYE ROV sales and service for Far East from newly retired Ian Johnson. The role of Head of Sales for the Diving product line and Specialised boats division has been fulfilled by Mike Warner who joins from the Unique Group office in Sharjah. And on customer support for sales and rental side is Junior Sales Engineer Toh Jun Xiang. Recently the team performed a very successful trial mating of the Crest Odyssey’s SPHL to the HRF in Singapore. The HRF has now been deployed to Brunei with McDermott to support their diving operations for SHELL. 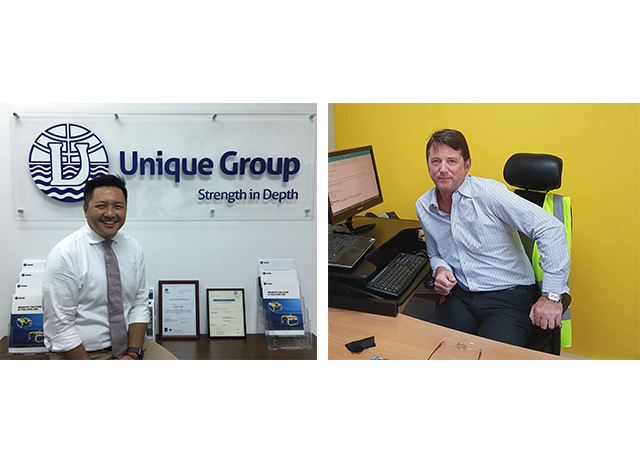 Please contact the Unique Group Singapore team to find out more about what’s in stock, and how they can assist you with your upcoming diving, salvage, installation or load-testing projects.